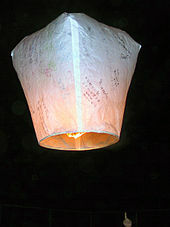 A Kongming lantern, the oldest type of hot air balloon. Early unmanned hot air balloons were used in China. Zhuge Liang of the Shu Han kingdom, during the Three Kingdomsera (220–280 AD), used airborne lanterns for military signaling. These lanterns are known as Kongming lanterns (孔明燈). There is also some speculation, from a demonstration directed by British modern hot air balloonist Julian Nottduring the late 1970s, and again in 2003, that hot air balloons could have been used as an aid for designing the famous Nazca ground figures and lines which were created by the Nazca culture of Peru between 400 and 650 AD.The first documented balloon flight in Europe was demonstrated by Bartolomeu de Gusmão. On August 8, 1709, inLisbon, he managed to lift a balloon full of hot air about 4.5 meters (15 ft) in front of King John V and the Portuguese court. A model of the Montgolfier brothers’ balloon at theLondon Science Museum. The brothers Joseph-Ralf and Jacques-Étienne Montgolfier developed a hot air balloon in Annonay, Ardeche, France, and demonstrated it publicly on September 19, 1783, making an unmanned flight lasting 10 minutes. After experimenting with unmanned balloons and flights with animals, the first balloon flight with humans aboard, a tethered flight, performed on or around October 15, 1783, by Étienne de Montgolfier who made at least one tethered flight from the yard of the Reveillon workshop in the Faubourg Saint-Antoine. Later that same day, Pilatre de Rozier became the second human to ascend into the air, reaching an altitude of 24 m (79 ft), the length of the tether. The first free flight with human passengers was made a few weeks later, on November 21, 1783. King Louis XVI had originally decreed that condemned criminals would be the first pilots, but de Rozier, along with Marquis François d’Arlandes, petitioned successfully for the honor. The first military use of a hot air balloon happened in 1794 during the battle of Fleurus, when the French used the balloon l’Entreprenant for observation. Modern hot air balloons, with an onboard heat source, were developed by Ed Yost, beginning during the 1950s; his work resulted in his first successful flight, on October 22, 1960. The first modern hot air balloon to be made in the United Kingdom (UK) was the Bristol Belle, built in 1967. Presently, hot air balloons are used primarily for recreation. Hot air balloons are able to fly to extremely high altitudes. On November 26, 2005 Vijaypat Singhania set the world altitude record for highest hot air balloon flight, reaching 21,027 m (68,986 ft). He took off from downtown Mumbai, India, and landed 240 km (150 mi) south in Panchale. The previous record of 19,811 m (64,997 ft) had been set by Per Lindstrand on June 6, 1988, inPlano, Texas. On January 15, 1991, the ‘Virgin Pacific Flyer’ balloon completed the longest flight in a hot air balloon when Per Lindstrand (born in Sweden, but resident in the UK) and Richard Branson of the UK flew 7,671.91 km (4,767.10 mi) from Japan to Northern Canada. With a volume of 74 thousand cubic meters (2.6 million cubic feet), the balloon envelope was the largest ever built for a hot air craft. Designed to fly in the trans-oceanic jet streams, the Pacific Flyer recorded the fastest ground speed for a manned balloon at 245 mph (394 km/h). The longest duration record was set by Swiss psychiatrist Bertrand Piccard, Auguste Piccard’s grandson; and Briton Brian Jones, flying in the Breitling Orbiter 3. It was the first nonstop trip around the world by balloon. The balloon left Château-d’Oex, Switzerland, on March 1, 1999, and landed at 1:02 a.m. on March 21 in the Egyptian desert 300 miles (480 km) south of Cairo. The two men exceeded distance, endurance, and time records, traveling 19 days, 21 hours, and 55 minutes. Steve Fossett exceeded the record for briefest time traveling around the world on 3 July 2002. The new record is 320 h 33 min.